An invasive brown tree snake spotted during a survey in Guam. Adam Knox was a week into learning how to capture brown tree snakes on the Pacific island of Guam when the first one slithered out of his grasp. He was training for a seek-and-destroy task force capable of deploying to isolated islands and removing any invasive brown tree snakes before they had a chance to wreak the type of havoc on wildlife, humans and even infrastructure they already had on Guam. The former U.S. Geological Survey biologist had beginners luck with the first couple reptiles when he spotted a 3.5 feet-long serpent in a tree about waist high off the ground. He ran to grab the snake, but suspects the tall grass he stepped on between them tipped the invader off early. He tried to grab it by the tail—not the right way to capture a snake—and missed completely due to the thick leather gloves he was wearing for protection. The snake took off. “There’s dense foliage so you cannot get through it quickly. By the time you even look down they’re gone,” Knox, now a resource manager at the Maui Invasive Species Committee, told Earther. If Knox had only thought to bring an airsoft gun, he may have stopped this invader in its tracks. A recent study Knox published with his coauthors in Wildlife Society Bulletin details exactly how he and his fellow snake-killing wildlife managers are starting to use these weapons—basically toy guns, designed to shoot plastic, or even biodegradable resin, pellets—to fight the invasive scourge. Wildlife biologist Adam Knox demonstrating the use of an airsoft gun to stun invasive brown tree snakes. “This is one more tool you can have in your toolbag to get that snake before it can reproduce or lay eggs,” Knox said. Useful for sniping snakes high up in trees, or otherwise hard to reach, these guns may wind up being the critical weapon that stops future invasions on snake-free islands. Brown tree snakes are native to parts of Australia, Indonesia, Papua New Guinea and other Pacific islands. They were introduced into Guam sometime around World War II, possibly as a stowaway on a ship, and proceeded to eat their way through native wildlife, eventually leading to the extirpation of 10 of the 12 native bird species as well as small mammals and lizards. The loss of these birds and their seed-dispersing services has also led to the decline of trees on the island, according to one study. And the problem doesn’t only affect native wildlife. Knox says that the big snakes—they can measure up to 10 feet long—may attack chickens, while others will slither into people’s homes, where they have even been found trying to swallow the hands of sleeping infants. “They have very keen sensory organs and smell. 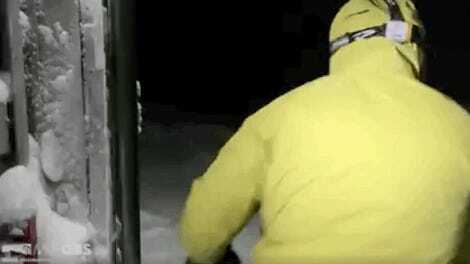 They are just looking for whatever they can get,” he says. They can also cause power outages by climbing onto power lines or slithering into electrical stations. One even turned up the heat on Knox’s home life. “Our air conditioner went out and sure enough when we pulled out the cover to see what was going on with it, there was a dead brown tree snake in there,” he said. While these snakes are nearly out of control on Guam, with some estimates putting them at more than 1.5 million individuals, Knox believes airsoft guns can help researchers eliminate snakes which might make their way to new islands like Sipan or those in Hawai’i before they cause much damage to the local wildlife. He says that the idea came from locals on Guam who already used the guns to kill the snakes around their houses. Knox and his collaborators from USGS and Colorado State University took some into the lab and tested shooting captured snakes from a fake tree. “We found most of the snakes just dropped to the ground and stayed within a few meters,” he said, adding that the pellets sometimes killed them right away. Otherwise, the snakes could be euthanized within a few minutes. The guns the researchers used are automatic and had tracers, making it fairly easy to hit snakes even during the night, when they are most active. Knox says the guns are particularly helpful because these snakes are easiest to catch when they are first sighted. He says that his taskforce has spent weeks to months finding rogue snakes after hearing reports, if at all. If a snake escapes, his team might not get another chance. Christy Martin, program manager at CGAPS-Coordinating Group on Alien Pest Species, a partnership of agencies and non-governmental organizations working together to protect Hawaiʻi from invasive species, praised Knox’s research into this technique, noting that it can be very difficult to get to the reptiles, especially when they are 25 feet up in a tree. “We need more tools to deal with not just brown tree snakes but other species,” she told Earther. 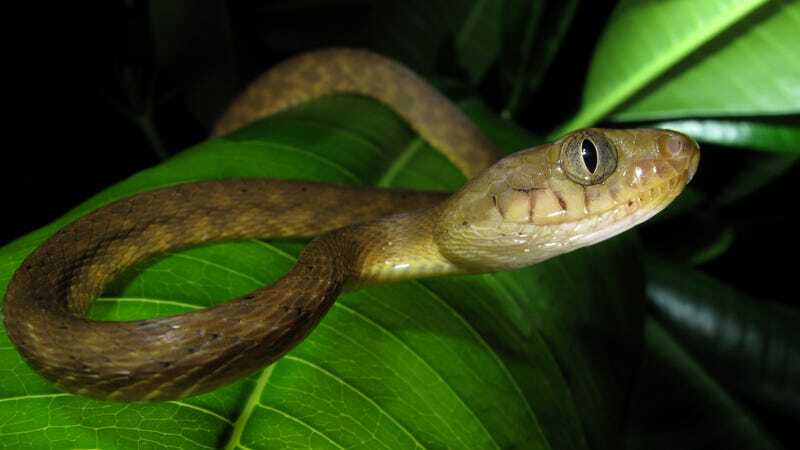 The Hawaii Invasive Species Council says that eight brown tree snakes were found dead or alive between 1981 and 1998 and Knox says that one sighting was reported in 2004, the council say that the reptiles aren’t known to be established in the state. But Martin says that other invasive serpents are. These problem snakes were often initially pets which were later released or escaped. Others come in as unintentional hitchhikers, hiding out in old boxes people transport while moving or getting into airplanes via landing gear. She says that the state, which has no native snake species, has had 236 credible snake sightings reported in the last decade. “We have a snake problem in Hawai’i,” she said, adding that the airsoft guns are fairly cheap and don’t require jumping through regulatory hoops for use by wildlife managers. Ultimately, the best way to curb the spread of invasive species like brown tree snakes is to stop them from arriving in the first place, either through better public education or tighter monitoring of common entry points, according to Martin. But until we figure out how to secure our borders from the serpentine invaders, toy guns may be our best hope. Joshua Rapp Learn contributes features on archaeology, ecology and the adventures involved in the research.